The nightlife out and about in Sin City can be a grand adventure, but sometimes it is fun to stay away from the crowds and enjoy a fun and games night in with good friends. Pizza makes a perfect party food, and ordering for delivery makes it easy on the party hosts. Having a night out on the town with friends can be great fun in Las Vegas, but changing things up and staying home can be entertaining too. Plan an adult’s only pizza party, invite your best friends over, and find out just what sort of fun you can create. Get out the cards. Depending on your space and the number of partiers, you might set up several tables with various card games. Maybe a trivial pursuit match or an old-fashioned charades competition is more your groups’ speed. Whatever you decide to play, serving pizza combos is a winner. Make your gathering easy on yourself because after all, you work hard and deserve to have a good time too. Tell your friends you are hosting a BYOB party and ordering in for appetizers and pizza. You might wait until everyone is present to see which delicious combinations everyone is craving. There are bound to be some interesting ideas tossed around. Unless you want to afford the whole food bill, you could also take up a collection while you take their orders. Outdoor get-togethers in Las Vegas are always a good idea, and there isn’t anything more relaxing than enjoying the company of good friends along with appetizers, pizza, and drinks by the pool. 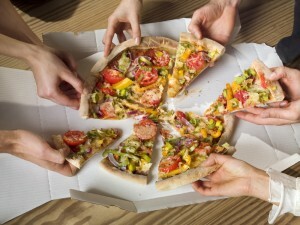 Look downtown for pizza in Las Vegas, and order with delivery for a fun evening spent at home with friends.